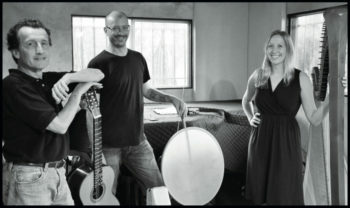 Harrison, Colvig, and some of their instruments. 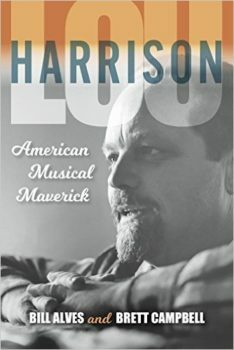 Now that we are in the midst of Lou Harrison centennial celebrations, his music is everywhere. Yet many significant and high quality pieces of Harrison’s are rarely performed. They often demand unusual or homemade instruments frequently tuned to the non-standard scales of just intonation. 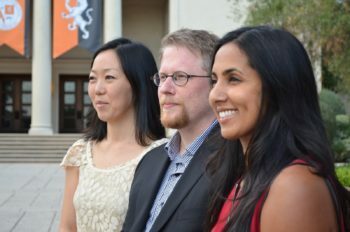 The fearless musicians of Los Angeles’ MicroFest specialize in exploring these regions that lie between the keys of the piano, so it will be a unique treat to hear Los Angeles ensembles Varied Trio and Just Strings resurrect some of Harrison’s most lovely chamber music May 12 at the Boston Court in Pasadena California. Harrison always loved the tintinnabulous timbres of metal bells, which led to his romance with the Javanese gamelan. 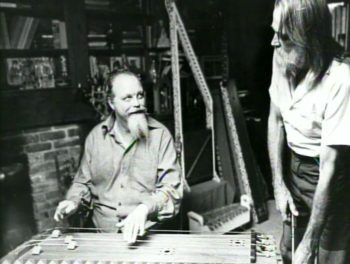 One of the types of instruments Harrison constructed with his partner, Bill Colvig, was a xylophone-like set of aluminum conduit pipes tuned to the crystalline sonorities of just intonation. 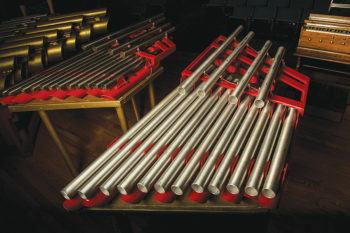 Two of these instruments (named “soprano bells” and “tenor bells”) formed part of a larger ensemble that became what Harrison referred to as his American Gamelan, but he also sometimes used them individually and with other instruments. Harrison’s first composition with these bell instruments was his puppet opera Young Caesar, where they rang out together with a panoply of unusual Western and Asian instruments. This version of the opera has remained unperformed since its 1971 premiere (also in Pasadena), but on May 12 we will hear a suite of the work’s most entrancing instrumental interludes performed on reconstructions of the original instruments. Harrison considered Young Caesar one of his greatest works, and it was one of his life’s regrets that it was never again produced in his lifetime. Our book tells the whole turbulent story of this opera’s various incarnations—including the tale of the flying phalli. The radiant sounds of the bell tube instruments also show up in a 1972 Solo and in the quirky score Harrison wrote for James Broughton’s 1987 film Scattered Remains. (MicroFest screened the original Scattered Remains at UCLA last month.) Although the ever-practical Harrison later adapted this score for conventional chamber orchestra, the more intimate original version includes unusual percussion, retuned harpsichord, and the sonorities of the justly tuned bells. It’s possibly the closest Harrison ever got to the then-popular minimalist style. But the real gem of this extraordinary concert is the original version of Harrison’s 1987 Varied Trio (the namesake of one of the performing ensembles). Harrison’s good friends David Abel and Julie Steinberg suggested the piece, and Harrison decided he wanted to write something that would be fun to play with his friends. So he added percussionist William Winant, his partner Bill Colvig, and himself to create an exotic ensemble of violin, retuned harpsichord, retuned harp, bell instruments, and percussion. This Varied Quintet, its original title, premiered at Harrison’s 70th birthday concert in Berkeley, California. Even so, Harrison recognized the difficulty it would present Abel and Steinberg when they wanted to tour with the piece, so he arranged it for their trio in the standard tuning of equal temperament. As far as I know, the original version has never been performed since its 1987 premiere. The difference in instruments makes the Trio and Quintet almost completely different compositions. For example, the first movement pairs one of Harrison’s alluring violin melodies with an ensemble based on the forms and patterns of Javanese gamelan (its title, “Gendhing,” is the Javanese word for gamelan composition). In the Quintet version to be revived this month, the interweaving just intonation bell instruments sparkle within an entirely different texture than what can be coaxed from the conventional piano. Harrison was a prolific composer (the works list in our book contains over 400 entries), and he often did not shy away from exotic demands even in some of his most enchanting works. I hope you can join us at this unusual opportunity in Pasadena May 12.